The stars are not always kind -- a drawback for an astrologer as upbeat as Darrell Martinie. So the man known on radio broadcasts as the Cosmic Muffin often found a way to leaven the burden of bad news. ``Let's face it, when you're talking to a client you don't want to say, `In four years you'll get a divorce,' " he told the Globe in 1978. ``You say, `In four years you'll come into a stressful period in your relationship.' "
He was such a believer in fate that he probably was sure it was meant to be when William F. Weld, then the governor, named him the state's official astrologer 13 years ago. Mr. Martinie, who was 63, spent three decades dispensing advice on radio stations in Boston and nationwide. He died of cancer at his home in Saugus Wednesday. ``He was witty, clever, and irreverent," said Edward Boesel, who married Mr. Martinie two years ago after they had been a couple for more than 31 years. Thousands tuned into Mr. Martinie to divine clues about the future, but his own past could be a tad murky. ``Darrell every now and then took a little bit of the artist's license," Boesel said. ``He used to claim he was 38 years old, and this was after we had been together for 27 years." This much seems certain: He was born in Massachusetts and as a child moved with his family to Illinois, where he lived in several communities while growing up. Mr. Martinie, whose last name was often misspelled like the drink, was the oldest of five children. He attended the University of Illinois, where he studied political science and graduated with a degree in psychology. He entered a Benedictine monastery in the early 1970s, intending to become a monk, but left after several months. He has a son from his first marriage, which ended in divorce. In the 1978 interview, he said his first meeting with an astrology group left him cold. ``I thought the people were absolutely stupid," he said. Then he delved more deeply and moved beyond sun signs -- the 12 zodiac symbols that are as far as many people get. The charts Mr. Martinie prepared took note of the position of the sun, moon, and the planets at the moment a client was born, what astrological houses they were in, and their celestial relationships to one other. That information formed the foundation for a complex process of charting the course of the changing heavens through a client's life. ``At the moment, place, and time a person is born, there is a blueprint on that life," he said in a 1988 Globe interview. ``You are predestined." He added that ``sun sign columns are garbage. . . . The idea that people fall into 12 categories and those categories can be interpreted as personal forecasts is ludicrous." Boesel said, ``Astrology is much, much more than that." And he speaks as an engineer whose professional discipline was earthbound -- a dichotomy that enhanced his relationship with Mr. Martinie. ``I provided the anchor that kept him on the ground, and he provided the balloon to lift me off," Boesel said. In 1973, Mr. Martinie was listening to WBCN when legendary radio personality Charles Laquidara said on-air that the moon was in Cancer and Leo. Mr. Martinie called to correct Laquidara: The moon couldn't be in both houses at once; it was moving from Cancer to Leo part way through the day. ``Charles said, `Just a second, let me put you on the air,' " Boesel said, ``and he discovered that Darrell was quite witty." From that call a broadcast career was launched. 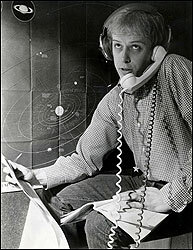 Mr. Martinie provided astrological weather reports on WBCN, several other radio stations, and on television for a quarter century in the Boston area. He was syndicated to stations nationwide, from Los Angeles to Portland, Maine. Although Mr. Martinie's broadcast persona could be playful and irreverent, the moments before he went on the air in radio or television could be brutal. He often was sick to his stomach. ``And when the little red light came on, he was all show time," Boesel said. ``Everything else went away and his stage presence took over." Mr. Martinie began easing into retirement beginning in the late 1990s and found it a good fit. But on his birthday three years ago, a biopsy resulted in a cancer diagnosis. He had always worn eye-catching clothes in public and did not waver during treatment at Dana-Farber Cancer Institute. ``He was always onstage when in public," Boesel said. ``Even at the end, when he went to Dana-Farber he would make sure to wear an outfit they had not seen before and exchange repartee with everyone along the way." After Mr. Martinie's funeral Mass tomorrow, the Roma Band -- musicians known to many for their performances at feasts in the North End -- will lead the funeral progression from the church to the cemetery. Boesel said he and Mr. Martinie had been a couple for 33 years, 6 months, and 19 days, ``and truly, the last year with him was the best we ever had together." In addition to his husband, Mr. Martinie leaves his son, John Greene of Algonquin, Ill.; three sisters, Bonnie of Naperville Ill., Beverly Foster of Maui, Hawaii, and Susan Hickerson of East Peoria, Ill.; and two grandsons. The funeral Mass will be said tomorrow at 10:30 a.m. in Blessed Sacrament Church in Saugus. Burial will be in Riverside Cemetery in Saugus.